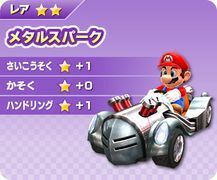 The Metal Spark is Metal Mario's kart that appears in the arcade game Mario Kart Arcade GP DX. It offers the user a speed and handling improvement, but does not affect acceleration. Its design is completely silver, with lights and spark plugs on the front, giving it the "Spark" in its name. Its alternate colors are blue and yellow. This page was last edited on March 6, 2018, at 18:53.